Katie's voice is relatable to today's market, making her the ideal voiceover. She is conversational and inviting, yet polished and professional. Katie is able to push the sales factor with energy to grab the attention of your clients. She is a native Tennessean turned Texan, with a strong ability to flex her authentic southern accent when needed. Katie is a female voice actor located in Austin, USA. Words that describe my voice are Youthful, Friendly, Professional. How soon can I get my recording back? Each voice talent has their general 'turnaround time' listed above. This is not a guarantee but each voice will aim to get back your recording in the quickest time. The sooner you hire them, the faster you'll have your recording back! Some talent provide 4 hour turnaround time for clients that need something super fast. To find out who is available right now to get something back within a few hours, we strongly recommend posting a FREE JOB NOTICE. How much will it cost to hire this voice? This depends on how many words are in the script and where the recording will be used. If it's not going to be used on television, radio or a phone system, there's a good chance it will fall into 'Non-Broadcast'. If it's going to be used on the internet then it would fall into 'Internet Only'. All the rates can be found on the Voice Over Rates page. Can I listen to this voice record my script? If this voice talent offers Phone/Skype Patch or ISDN, Source Connect, ipDTL, or SoundStreak facilities, then you can hear them record in real time. There is a small additional fee for this. One of the big differences between us and other websites is that ALL of our voice talent are professionals, so most of the time if you give them good, clear direction with the script, or point out a style in one of their demos that you like, they'll be able to replicate it for you without the need to listen in meaning you get your recording back sooner. Can I check that the voice is available or audition them before I hire them? You sure can! Our voice talent are full time voice actors, not hobbyists like on other sites. If a voice is UNAVAILABLE a logo will be clearly displayed on their profile along with their anticipated return date. If you need to audition a voice or check that they will be available to record at a specific time you can message them through the 'CONTACT / FREE AUDITION' link on their profile. Where it asks for a script, just mention that it's 'still being developed'. How do I make payment? What forms of payment do you accept? 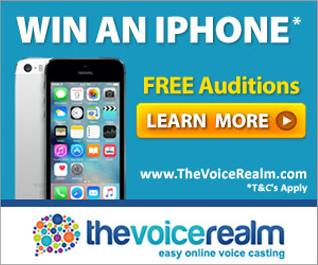 You simply click HIRE VOICE TALENT NOW next to their profile picture. The system will then lead you through. Prior to sending the script, you make pre-payment with a credit card which we hold onto. This protects you and the voice actor. When you're happy with the recording you click a button to close the job and release the funds. You'll also receive an instant tax invoice! We accept major credit cards and PayPal. We can also set up accounts with long term clients. How many re-records can I get to ensure my script is read the way I want? For jobs of less than 750 words you are able to request an additional two full re-records for changes in VOCAL TONE AND STYLE after the first full recording is delivered. If you change any part of the script after the voice actor records, small REVISION FEES apply. These are shown on the Voice Talent Rates page. We strongly recommend asking the voice actor for a few 30 second samples of varying styles to get the tone and speed correct before they record the entire script. Do I own the audio? What are the licencing terms? Recordings that are made for NON-BROADCAST use, including phone messages and YouTube clips, E-learning, audiobooks, personal use etc are buyout in perpetuity. Meaning you own the recording for use in any 'non-broadcast' use forever with no additional fees. For BROADCAST recordings used as TV, Radio, or Internet Commercial spots, these licences are for 1 years usage from the date of recording. Buyout in perpetuity (unlimited usage forever) for these is double the rate. Recordings with multiple category uses should have all applicable rates selected. Can the voice talent add music or edit the recording into smaller files? Yes most talent offer these production services. However you must provide the voice with the music you want mixed with the voice. You also need to pay a small extra fee for this service. Make sure you add 'PRODUCTION' when you hire them. Where do the voice actors record the scripts? All our voice actors have professional broadcast quality recording studios. They record using professional microphones, not using cheap plastic microphones like you'll get at other websites. After all, they are representing your brand and product, and the sound reflects on the quality of your business, so you should have the best for a recording that's going to be used for years! There's lots more answers to common questions on our main F.A.Q. page. It's free and there's no obligation. So what are you waiting for?